For the film based on the novel, see Midnight's Children (film). Midnight's Children is a 1981 novel by British Indian author Salman Rushdie. It deals with India's transition from British colonialism to independence and the partition of British India. It is considered an example of postcolonial, postmodern, and magical realist literature. Midnight's Children won both the Booker Prize and the James Tait Black Memorial Prize in 1981. It was awarded the "Booker of Bookers" Prize and the best all-time prize winners in 1993 and 2008 to celebrate the Booker Prize 25th and 40th anniversary. In 2003, the novel was listed on the BBC's The Big Read poll of the UK's "best-loved novels". It was also added to the list of Great Books of the 20th Century, published by Penguin Books. The book begins with the story of the Sinai family, particularly with events leading up to India's Independence and Partition. Saleem is born precisely at midnight, 15 August 1947, therefore, exactly as old as independent India. He later discovers that all children born in India between 12 a.m. and 1 a.m. on that date are imbued with special powers. Saleem, using his telepathic powers, assembles a Midnight Children's Conference, reflective of the issues India faced in its early statehood concerning the cultural, linguistic, religious, and political differences faced by a vastly diverse nation. Saleem acts as a telepathic conduit, bringing hundreds of geographically disparate children into contact while also attempting to discover the meaning of their gifts. In particular, those children born closest to the stroke of midnight wield more powerful gifts than the others. Shiva "of the Knees", Saleem's nemesis, and Parvati, called "Parvati-the-witch," are two of these children with notable gifts and roles in Saleem's story. Meanwhile, Saleem's family begin a number of migrations and endure the numerous wars which plague the subcontinent. During this period he also suffers amnesia until he enters a quasi-mythological exile in the jungle of Sundarban, where he is re-endowed with his memory. In doing so, he reconnects with his childhood friends. Saleem later becomes involved with the Indira Gandhi-proclaimed Emergency and her son Sanjay's "cleansing" of the Jama Masjid slum. For a time Saleem is held as a political prisoner; these passages contain scathing criticisms of Indira Gandhi's over-reach during the Emergency as well as a personal lust for power bordering on godhood. The Emergency signals the end of the potency of the Midnight Children, and there is little left for Saleem to do but pick up the few pieces of his life he may still find and write the chronicle that encompasses both his personal history and that of his still-young nation, a chronicle written for his son, who, like his father, is both chained and supernaturally endowed by history. The technique of magical realism finds liberal expression throughout the novel and is crucial to constructing the parallel to the country's history. The story moves in different parts of Indian Subcontinent – from Kashmir to Agra and then to Bombay (now Mumbai), Lahore and Dhaka. Nicholas Stewart in his essay, "Magic realism in relation to the post-colonial and Midnight's Children," argues that the "narrative framework of Midnight's Children consists of a tale – comprising his life story – which Saleem Sinai recounts orally to his wife-to-be Padma. This self-referential narrative (within a single paragraph Saleem refers to himself in the first person: ″And I, wishing upon myself the curse of Nadir Khan." and the third: "'I tell you,' Saleem cried, 'it is true. ...'") recalls indigenous Indian culture, particularly the similarly orally recounted Arabian Nights. The events in the book also parallel the magical nature of the narratives recounted in Arabian Nights (consider the attempt to electrocute Saleem at the latrine (p. 353), or his journey in the 'basket of invisibility' (p. 383))." He also notes that, "the narrative comprises and compresses Indian cultural history." 'Once upon a time,' Saleem muses, 'there were Radha and Krishna, and Rama and Sita, and Laila and Majnun; also (because we are not unaffected by the West) Romeo and Juliet, and Spencer Tracy and Katharine Hepburn," (259). Stewart (citing Hutcheon) suggests that Midnight's Children chronologically entwines characters from both India and the West, "with post-colonial Indian history to examine both the effect of these indigenous and non-indigenous cultures on the Indian mind and in the light of Indian independence." 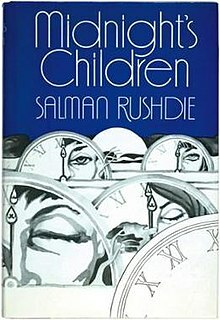 Midnight's Children has been called "a watershed in the post-independence development of the Indian English novel", to the extent that the decade after its 1981 publication has been called "post-Rushdie". During that decade, many novels inspired by Midnight's Children were written by both established and young Indian writers. Rushdie's innovative use of magic realism allowed him to employ the nation-as-family allegory and at the same time confound it with an impossible telepathy among a multitude of children from a multitude of languages, cultures, regions and religions. No one genre dominates the entire novel, however. It encompasses the comic and the tragic, the real, the surreal, and the mythic. The postcolonial experience could not be expressed by a Western or Eastern, public or private, polarity or unity, any more than any single political party could represent all the people of the nation. Midnight's Children was awarded the 1981 Booker Prize, the English Speaking Union Literary Award, and the James Tait Prize. It also was awarded The Best of the Booker prize twice, in 1993 and 2008 (this was an award given out by the Booker committee to celebrate the 25th and 40th anniversary of the award). The book went on to sell over one million copies in the UK alone. In 1984 Prime Minister Indira Gandhi brought an action against the book in the British courts, claiming to have been defamed by a single sentence in chapter 28, penultimate paragraph, in which her son Sanjay Gandhi is said to have had a hold over his mother by his accusing her of contributing to his father Feroze Gandhi's death through her neglect. The case was settled out of court when Salman Rushdie agreed to remove the offending sentence. In the late 1990s the BBC was planning to film a five-part mini-series of the novel with Rahul Bose in the lead, but due to pressure from the Muslim community in Sri Lanka, the filming permit was revoked and the project was cancelled. Later in 2003, the novel was adapted for the stage by the Royal Shakespeare Company. BBC Radio Four broadcast a seven-part dramatic adaptation in 2017 at the 70th anniversary of Indian independence. Director Deepa Mehta collaborated with Salman Rushdie on a new version of the story, the film Midnight's Children. British-Indian actor Satya Bhabha played the role of Saleem Sinai while other roles were played by Indian actors Shriya Saran, Seema Biswas, Shabana Azmi, Anupam Kher, Siddharth Narayan, Rahul Bose, Soha Ali Khan, Shahana Goswami, Anita Majumdar and Darsheel Safary. The film was premiered in September 2012 at the Toronto International Film Festival (2012-09-09) and the Vancouver International Film Festival (2012-09-27). For an academic overview of the adaptations of Midnight's Children, see Mendes and Kuortti (2016). In June 2018 streaming service Netflix announced that it is adapting 'Midnight's Children' as an original Netflix TV series. ^ Mullan, John. "Salman Rushdie on the writing of Midnight's Children." Guardian. 26 July 2008. ^ "Midnight's Children wins the Best of the Booker". The Man Booker Prizes. Archived from the original on 21 November 2008. ^ a b "Rushdie wins Best of Booker prize". BBC News. 10 July 2008. ^ a b c d Stewart, N. (21 June 1999). "Magic realism as postcolonialist device in Midnight's Children". Archived from the original on 30 December 2006. ^ Rege, Josna E. (Fall 1997). "Victim into Protagonist? 'Midnight's Children' and the post-Rushie National Narratives of the Eighties". Studies in the Novel. 29 (3): 342–375. JSTOR 29533221. ^ Afzal-Khan, Fawzia (1993). Cultural Imperialism and the Indo-English Novel: Genre and Ideology in R. K Narayan, Anita Desai, Kamala Markandaya and Salman Rushdie. Pennsylvania State University Press. ^ Rubinson, Gregory J. (2005). Salman Rushdie. Fiction of Rushdie, Barnes, Winterson and Carter: Breaking Cultural and Literary Boundaries in the Work of Four Postmodernists. McFarland and Company. pp. 29–76. ^ Schultheis, Alexandria W. (2004). Postcolonial Lack and Aesthetic Promise in Salman Rushdie's Midnight's Children and The Moor's Last Sigh. Regenerative Fictions: Postcolonialism, Psychoanalysis, and the Nation as Family. New York: Palgrave Macmillan. pp. 105–151. ^ Eaglestone, Robert; McQuillan, Martin (2013). Salmon Rushdie. Contemporary Critical Perspectives. London: Bloomsbury Publishing. ^ Rushdie, Salman (2002). Step across this line: collected nonfiction 1992–2002. Random House. p. 77. ISBN 978-0-679-46334-4. ^ "Literary Encyclopedia – Midnight's Children". litencyc.com. ^ "BBC Radio 4 - Midnight's Children". ^ "Rushdie visits Mumbai for 'Midnight's Children' film". The Times of India. Archived from the original on 14 January 2010. ^ "I'm a film buff: Rushdie - The Times of India". ^ "Deepa finds Midnight's Children lead". The Times of India. 21 August 2010. Retrieved 9 April 2011. ^ "Dreaming of Midnight's Children". The Indian Express. ^ Jha, Subhash K. (31 March 2011). "Darsheel Safary Darsheel Safary in Midnight's Children". The Times of India. Retrieved 20 May 2011. ^ "viff.org - Vancouver International Film Centre". ^ Nolen, Stephanie (15 May 2011). "Mehta at midnight". The Globe and Mail. Retrieved 17 May 2011. ^ Mendes, Ana Cristina; Kuortti, Joel (21 December 2016). "Padma or No Padma: Audience in the Adaptations of Midnight's Children". The Journal of Commonwealth Literature. 52 (3): 501–518. doi:10.1177/0021989416671171. hdl:10451/29281. ISSN 0021-9894. ^ Economic Times (29 June 2018). Netflix to adapt Salman Rushdie's 'Midnight's Children' as original TV series. Santiago, Juan-Navarro. "The Dialogic Imagination of Salman Rushdie and Carlos Fuentes: National Allegories and the Scene of Writing in Midnight's Children and Cristóbal Nonato." Neohelicon 20.2 (1993): 257–312.